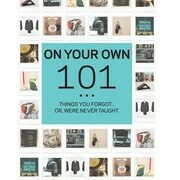 Bainbridge Islander Chris Kelly is the author of On Your Own 101: Things You Forgot or Were Never Taught (2011). Kelly says the book was inspired by her son's graduation from high school and her realization that young adults striking out on their own often do not know how to confront everyday problems. Her short but informative book offers advice on a wide range of issues, from jump-starting a car to plunging a toilet, from what to do when you lose your credit card to properly introducing people.